by Bicycling, Runner's World and Prevention magazines and the American Hiking Society." 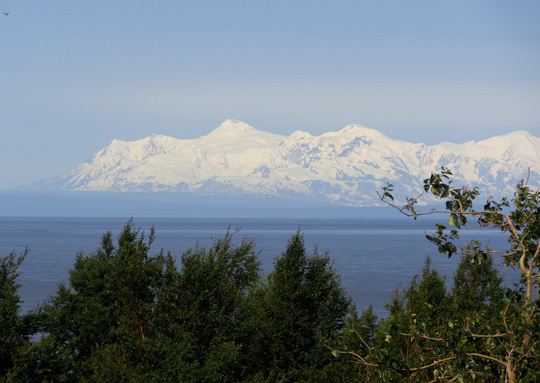 This was another perfectly beautiful day in Anchorage � and we finally got a good view of the volcanoes to the southwest!! It�s amazing how much more we enjoy the sunny days than the wet ones. Overcast is OK except when we want nice mountain views. Rain is no fun when you're on vacation but we try to make the most of it and not get too bummed out. Because it was clear last night the temps were lower this morning than yesterday, only 50 F. at our camper when I got up at 7 AM. It warmed into the 60s F. pretty fast since it was sunny. The high temperature officially was about 70 F. at the airport and upper 60s at our campsite. We even had the air conditioner on in the truck for the first time that I can remember in weeks. The camper was warm inside (73 F.) when we got back at 2 PM. We vented it with the Fantastic Fan and some open windows instead of turning on one or both AC units. Cody was fine but very happy to see us. He had to stay home this morning. We like to joke that Cody needs a bike. Jim and I had a great bike ride this morning. We didn�t go fast because we originally planned to do 20+ miles tomorrow at Lake Eklutna. Now we�ll probably put that off until Friday. We rode more than planned today, 16� miles. We began riding about 10 AM. We parked at a school on Northern Lights Blvd. at Bragaw St., rode across the busy four-lane boulevard at a traffic light, and hopped on the Chester Creek bike path. There are other trailheads at various parks along the greenway. Trees block the view and noise of nearby city streets for much of the Chester Creek Trail. 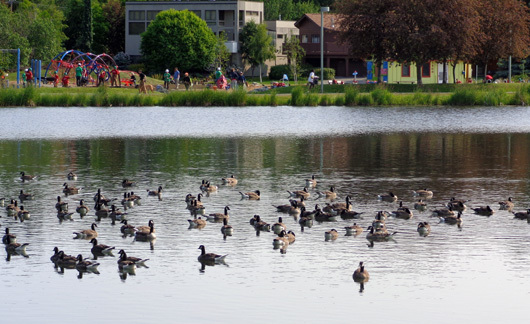 The Chester Creek Greenway stretches east to west across the city for 6� miles. 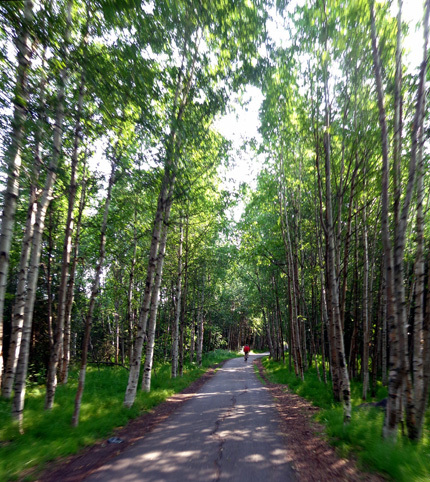 It is part of the extensive paved multi-use trail network in Anchorage that has us delighted and amazed. With more than 135 miles of paved bike paths -- and another 300 miles of unpaved and wilderness trails in and near the city -- there have to be more bike/hike trails per capita in this area than just about anywhere else in the country. What a great resource for residents and visitors! 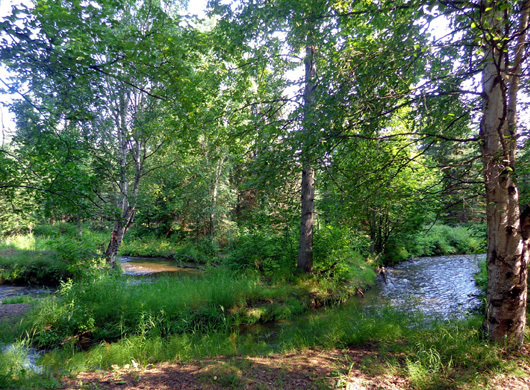 Much of the Chester Creek Trail is shady. Peaceful little lake along the Chester Creek Greenway. In addition to all these trails, there are hundreds of miles of paved and dirt roads at JBER, in the city, and on the hillsides where Jim can ride his StumpJumper mountain bike. He's got so many places to ride, he's having trouble deciding! There are all kinds of spur trails going off from Chester Creek that allow access to neighborhoods and parks. I was leading most of the way outbound (despite the two pictures above that show Jim ahead of me) and had to stop a couple times to be sure we were on the right path. The return was easier because we recognized where we'd already been. 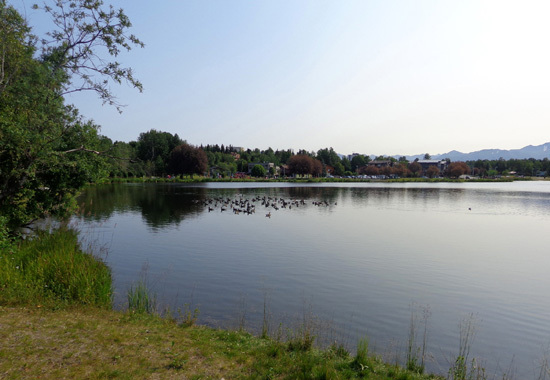 There are two pictures of ducks in the lagoon in the last section of this entry. I CAN SEE FOR MILES & MILES & MILES . 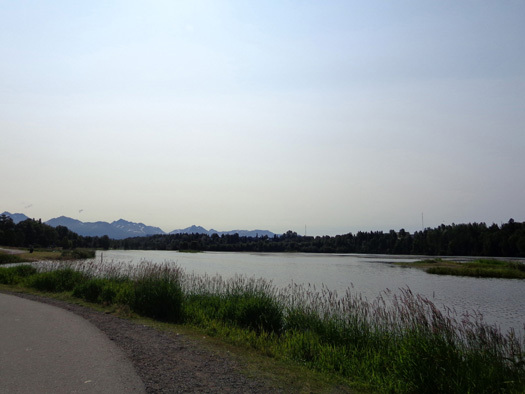 . .
We originally thought we�d just turn around at Westchester Lagoon after riding 4� miles and return to the truck. However, as we neared the coast I got a glimpse of beautiful snow-covered peaks and realized it was Mt. Spurr and the other four volcanic mountains that are in the Alaska Range southwest of Anchorage � and they were more clear than we�ve ever seen them! of Point Woronzof is the volcanic mountain range. It�s too bad we didn�t have such clear weather while we were on the western Kenai Peninsula because it�s closer to the mountains. We never did see those peaks from Homer, Kenai, or Capt. Cook State Recreation Area, all reported to be great vantage points. I thought maybe we could see the volcanoes from nearby Earthquake Park but the angle isn�t right and there are too many trees. Jim also remembered that there�s supposed to be a view to the north of Mt. 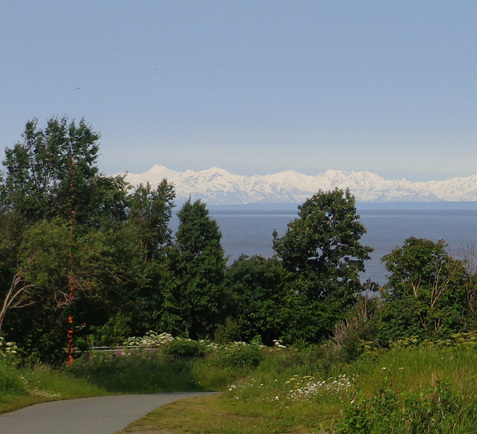 McKinley from that park on clear days but we couldn�t see it from anywhere on the Coastal Trail today. There were some low clouds and the sky wasn�t as clear up that way in the Alaska Range. 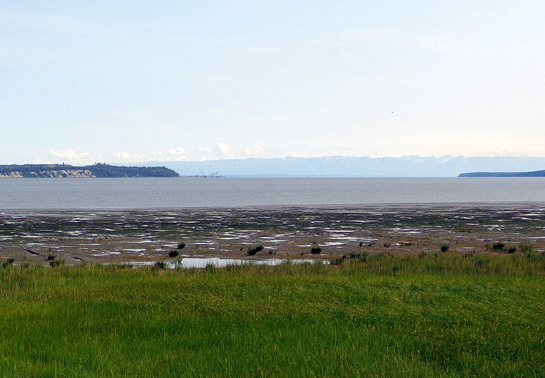 Wish we�d thought to take our binoculars but we really didn�t plan to ride on the Coastal Trail today. Mt. McKinley AKA Denali is located; it's under those clouds somewhere. 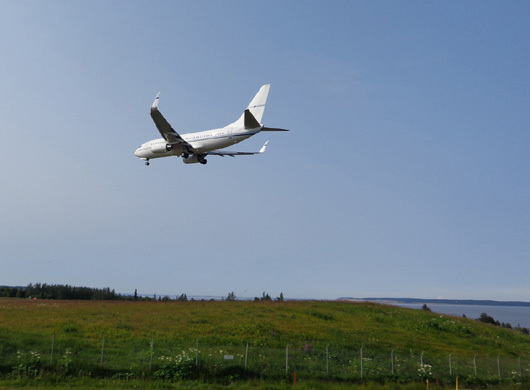 While we were at the high place on the Coastal Trail we watched four planes come in very close to us to land at the airport. 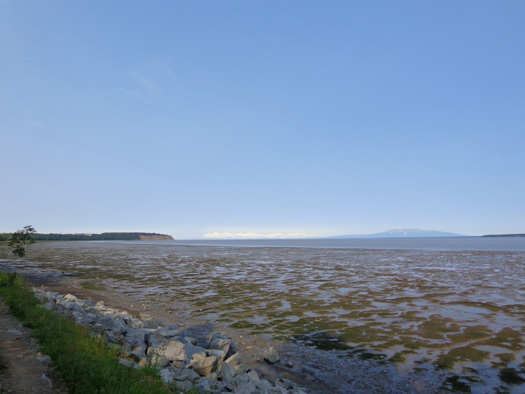 They were coming from the west over Cook Inlet. The last time we were here they landed from the other direction and took off over Cook Inlet, right above the bike path. We�ve also had quite a bit of air activity the first three days we've been at JBER � F-22s, C-17 cargo planes, and other military aircraft fly in and out over the campground. Yes, they are very noisy but they are enough of a novelty to us that we're more intrigued than annoyed by them. Fortunately, we haven�t heard them at night past 10 PM. They won�t wake us up unless we sleep late in the morning. Jim rides ahead of me on the Coastal Trail during low tide this morning. At high tide the water is close to the edge of the trail at this spot. 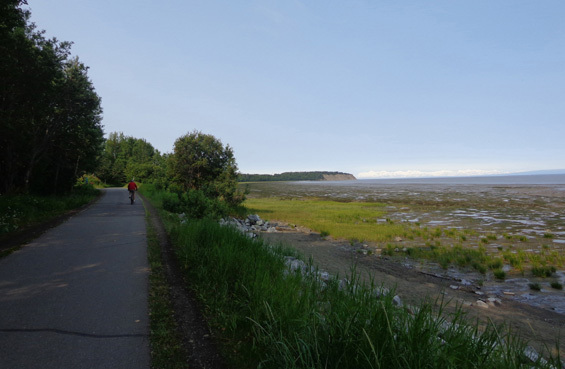 There were lots of other people out on the Chester Creek and Coastal trails today � cycling, walking, running. The only hairy situation we had was in a narrow tunnel when four oblivious women with baby strollers came through at the same time in the other direction and barely gave Jim and me adequate room to pass in single file. The Chester Creek Trail goes under several major streets and over the creek several times on wooden bridges. We had to wait outbound and inbound for a couple minutes to cross busy Northern Lights Blvd. near our parking spot. I don't remember any other on-street crossings on that trail. 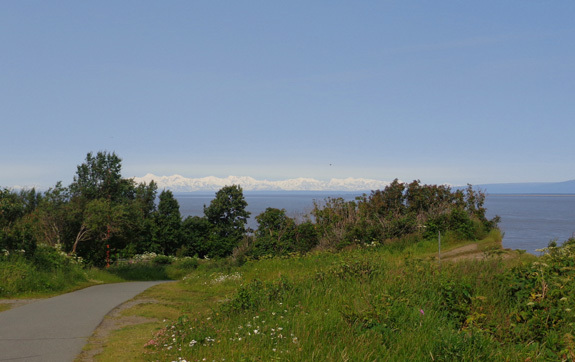 The Coastal Trail crosses at least one not-busy roadway and the entrances to several sometimes-busy parking areas. 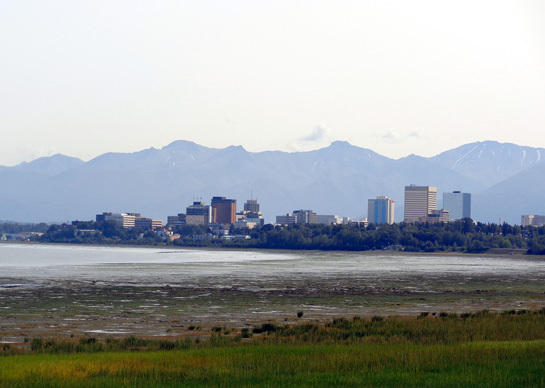 The Chugach Range frames downtown Anchorage at low tide; this view is from the Coastal Trail. 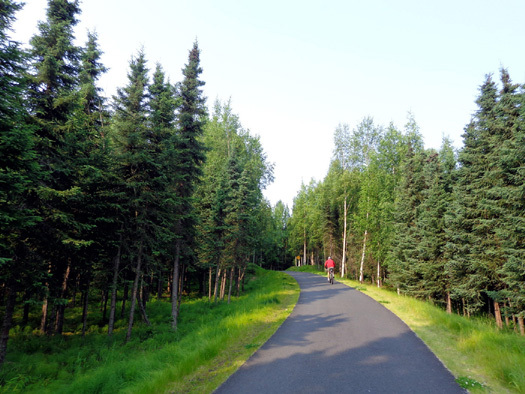 Gotta be very alert for people, vehicles, dogs, and large wildlife like bears and moose on all of Anchorage's bike paths! Too bad we didn't see any big critters today. We know they're out there. We've seen 'em. 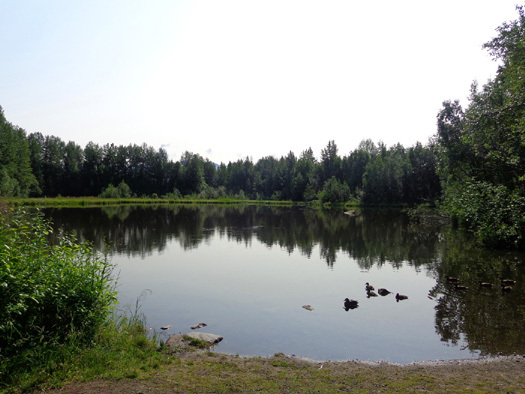 When we got done with our bike ride we drove to WalMart and Sam�s Club to restock our supplies at cheaper prices than anywhere on the Kenai Peninsula. Before returning to our campground we drove through the Elmendorf Air Force side of the base and found Nancy and Wes. Since they are leaving in the morning for Valdez, we decided to have dinner this evening at the Wilderness Inn at Fort Richardson. Nancy and Wes have eaten there before and said it was good food at a low cost. Retirees always like to hear that! 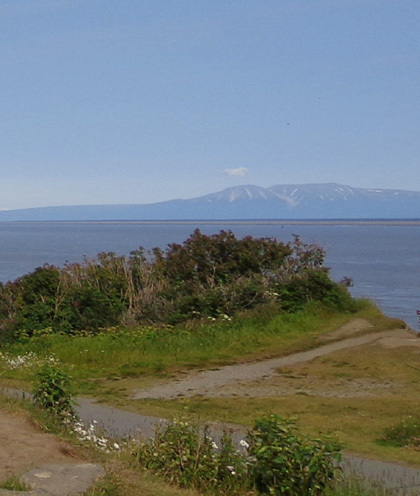 The "Sleeping Lady" as seen from the high point on the Coastal Trail today. We had a couple hours to read e-mail, shower, walk Cody, and relax at our campsite before supper. We enjoyed our dinner at the Wilderness Inn, which is definitely the nicest �mess hall� we�ve ever been in. 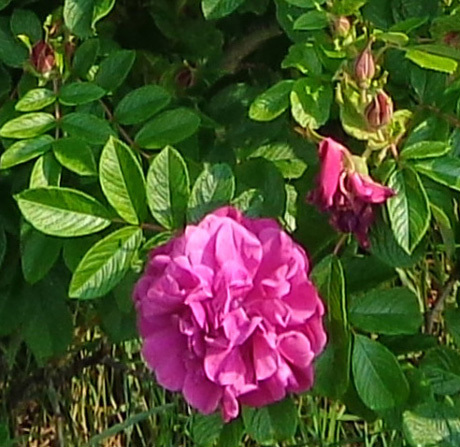 Our campground hosts were also there with two other couples but we didn�t see them until we left. The food was good. For a mere $4.55 each we had a choice of two entrees (five-spice breasts of chicken � I had one, Jim and West got two each) or pork stir-fry, a choice of two veggies (cabbage, carrots, or potatoes), rice, two kinds of soup, salad buffet, rolls, beverage (Jim and I had milk), and dessert (ice cream, pudding, cake, etc.). What a deal! We enjoyed the food, the setting, and having another 1+ hour with Nancy and Wes. That will probably be the last time our paths cross this summer. We returned to the camper in time to watch a special show on the local NBC channel re: Denali National Park. We enjoyed seeing various parts of the park and learned some information that will be helpful to us while we're there in early August. The program focused on maximizing the visitor experience while putting the least possible stress on the wildlife in the park. That's a continuing concern at some other national parks, too. At Denali visitation doubled from 44,000+ people per year in 1971 to 88,000+ per year in 1972 after the Parks Road was completed. This decade visitation has increased to over 400,000/year. Many of those folks are bused up from huge cruise ships like Princess Lines, which has the largest lodge complex near the entrance to the park. For several years traffic inside the park has been strictly regulated. Most visitors are allowed to drive in only 13-15 miles, then must take a park or tour bus, walk, or ride a bike any further along the 93-mile road to a mine at the end of the road. A lottery is held each year for a very limited number of spots in the fall when people can drive their own vehicles farther back into the park. 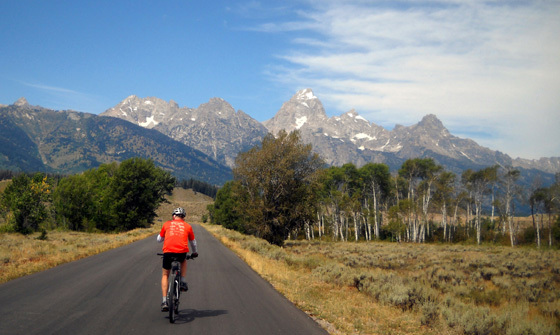 Many more people vie for these spots than "win" the road lottery. This is the only road through this huge park that visitors may use. (Plans are being developed for visitor services at the south end of the park but that�s years away from reality). The park road was originally built to help miners get gold from the mine 93 miles back, in lieu of building a rail line through what later became national park land. 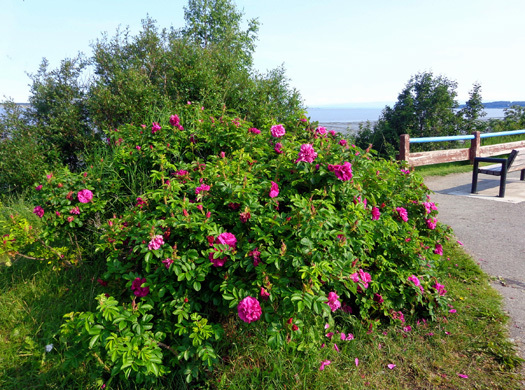 Pretty flowering shrub along the Coastal Trail overlooking Cook Inlet; see close-up below. After the heaviest visitation on record in 2007 park personnel began studying the behavior of wildlife in regards to how many buses are using the road to transport visitors to the interior of the park. 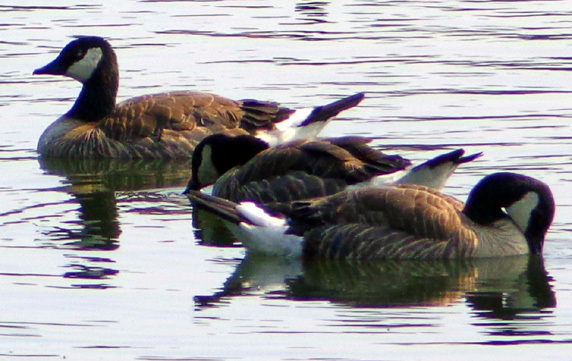 They put electronic devices on various species of animals to track their movements. As a result the buses are being spaced out a little farther so the sheep, wolves, bears, moose, and other critters will feel safe enough to cross the road. Staff has also gotten a lot of visitor feedback re: their preferences for feeling less crowded on buses, at rest stops, picture spots, etc. The general consensus is the fewer people around, the better. Most folks want a wilderness experience, not a theme park experience, at Denali. The program hit on some other challenges for the park, including the 1,000+ climbers each year that attempt to reach the summit of 20,320-foot Mt. 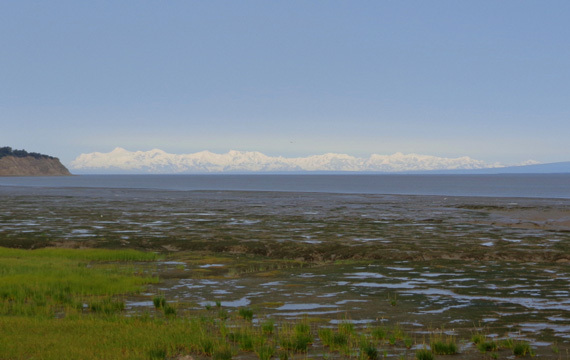 McKinley (I prefer the Native Alaskan name of Denali). Climbing season is April to July; it�s over now because the snow is too soft and unstable. Only 41% of the climbers made it to the summit and back this year and six of the other 59% died trying. That's more deaths than usual. Four were Japanese climbers who got caught in an avalanche and buried in a crevice. I thought the documentary was well done. We certainly enjoyed all the photos, history, and other information. I'm already excited about visiting Denali and wish we were going there tomorrow, not August 5.